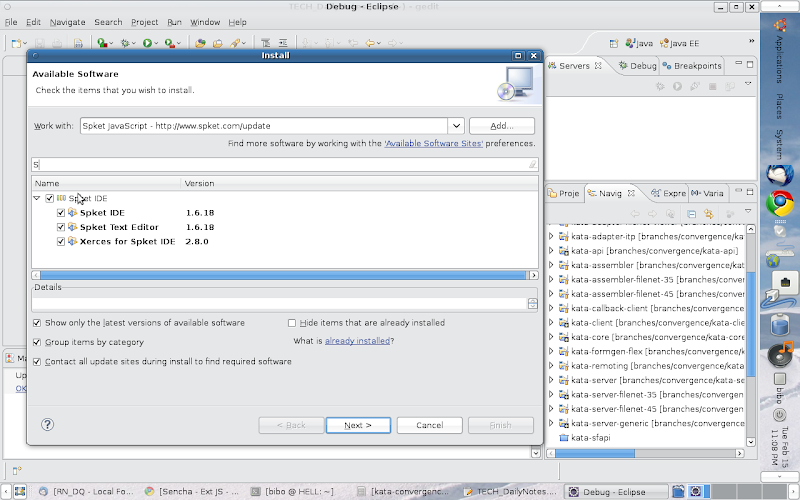 Here are simple steps to install and config the plugin for Eclipse 3.5 (Galileo) . + Click “Next” button again to confirm, then select “I accept the terms…” and click “Finish” to start installing. + Wait for downloading and installing, if there is some warning just click “Ok”, when it’s done restart Eclipse. + “JSB” approach: select “EXT JS” profile -> click “Add File” button -> browse to the ExtJS library which you downloaded (normally ext.jsb2 in the ext-3.x.x folder, or sdk.jsb3 in ext-4.x.x folder) , click “Open” . 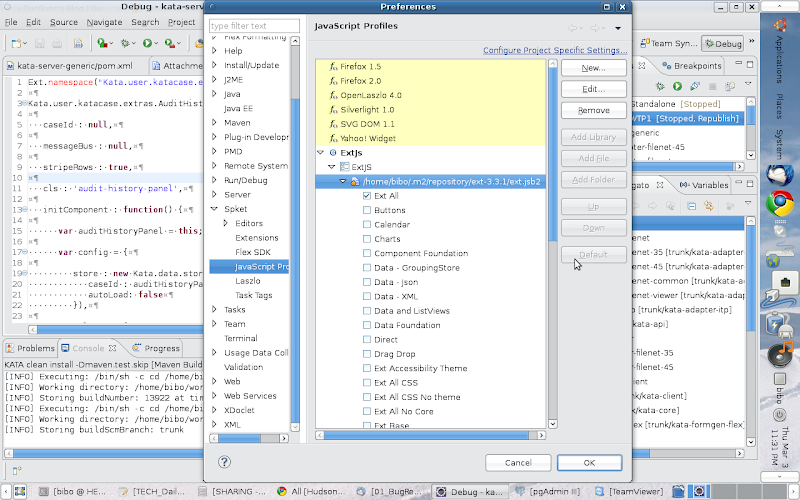 + Now in the profile, you can select the components for code-assisting (auto-completion), I selected Everything. 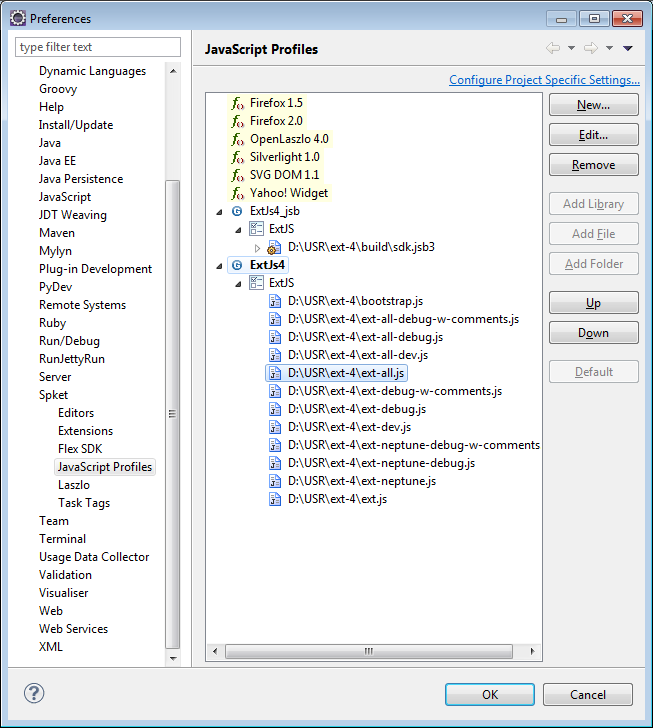 UPDATED: + “Add Folder” approach: (fallback when the JSB approach does not work – This works for almost all ExtJS versions – even 4.x, but it seems a bit slower) Select “EXT JS” profile -> click “Add Folder” button -> browse to the ExtJS SDK folder which you downloaded, click “Open” . Then the profile will show all the JS files of Ext SDK, by default (good, leave it as is). 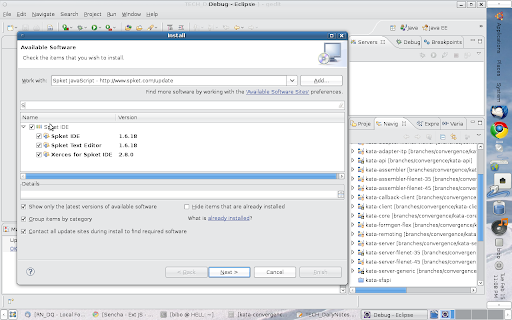 + Now click “Ok” to finish configuring. Given a JS file is open with Spket JS Editor, you can use hotkey Ctrl+Space (or Alt+/ ) to test auto-complete and stuff ! + Similar process can be done to create a Spket profile for jQuery :-) or YUI, but you can also use all those libs in just one profile ! + You can configure it more, such as modify the editor/formatter to change Tabs/spaces or something like that :-) . Good luck ! Hi Pr, I’ve updated some pictures in the post to make it easier to follow. If they are setup properly then the auto-complete should work :-) . I am running into same issue-no code assist enabled for ext js in eclipse.I did all the steps again and again and for ext js 4 and 3. I checked against steps you mentioned in your reply to previous post too. Please suggest what should be next step. Ctrl+space shows nothing on typing Ext..I am running from forums to forums .Everybody seems to have this problem but nobodt mentions what real problem was. I wasted so many days now i am freaking out. First of all, I recommend to take a rest when feeling stuck. Actually, when somebody is relaxing her/his brain is still working on a certain field and it may work better sometimes. 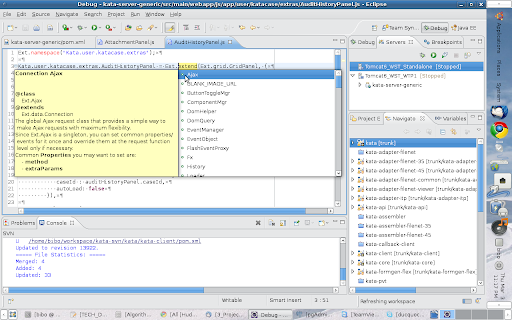 The Eclipse I used were Eclipse for Java EE 3.5 (Galileo) SR2, and the .jsb2 file was from the folder extracted from ext-3.3.1.zip . To be honest I haven’t tested with Ext4 so I’m not sure about it. Which versions did you use (ExtJS and Eclipse) ? 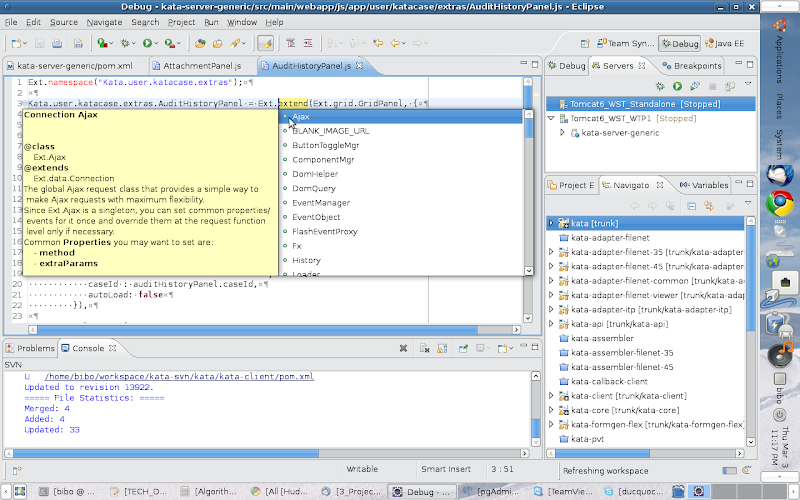 Is there some variants of Eclipse IDE (like ZendStudio, Aptana, FlashBuilder, … ) ? Another thing to check is the file permissions. On Linux the files created by daemon users or anonymous users (copied from Windows) are restricted by some permissions, by default. And that may prevent the tools from reading or executing the files, until they are resolved by commands like chmod, chgrp, chown . On some versions of Windows 64-bit , there are some mysterious bugs related to permissions too, when installed to a certain folder – “C:\Program Files (x64)” or something like that. In that case, the user should install on a short path which does not contains spaces or long names (exceeding the 8.3 DOS convention), like “D:\Soft\eclipse” or “D:\Soft\ext-3\” . Do you have complete ext js distribution? For 3.3.0 you need pkgs folder to be located in the folder where ext.jsb2 is. Not sure about 3.3.1 but think it’s the same. click default and follow remaining steps . Thank you for pointing out the “Add Folder” approach. Also, for ExtJS 4 the main jsb file to use is “sdk.jsb3” instead of “ext.jsb2” . Will it work with Sencha Touch 2.3.0 SDK? Thanks, this was very useful, one question. Regarding Create Spket profile for ExtJS, whilst adding the “JSB” I am a little stuck. I am using v4.2.1.883,I did not come across a file called ext.jsb2 or sdk.jsb3, so instead I used the “add folder” approach and pointed it to my root C:\lext-4.2.1.883 , it seems to work, is this an acceptable approach?